Footpegs modification is one of the most difficult parts of the project. They should be comfortable, adjoined mechanisms should work, and they should look good, because everyone can see them. It is also important to take care of the adjustments of the pegs and all the levers positions, so it was likely that an individual adjusting would be needed. Making footpegs from scratch is a difficult and expensive task, so we decided to adapt high-quality German adjustable footpegs LSL 2-Slide to our motorcycle. LSL 2-Slide footpegs are knockdown and consist of two main parts: the platform and the adjustment mechanism with a lever and a peg - just what we need! The range of the position adjustment is big enough. The platform we had to make ourselves, which wasn't easy, because the attachment points are in different plain surfaces, and there is an extending axis of pendulum. At least both sides of the platform are the same! On the left side, we decided to use the LSL part from Kawasaki ZX6R 2009. It fit because the shift lever is on the axis of the peg, the bar is connected to the bottom, and its length is enough. We made the pusher from a standard lever: it had to be shortened and bended by 70-80 degrees. The rod was shortened to fit the nearest adjustment position, since the thread length on the hinges is sufficient for the most distant position. It works well! The right side was complicated because the master cylinder of the rear brake is mounted on the footpeg. It would be difficult to leave the standard master cylinder, because it has a non-standard mount, and there is also a brake box with a hose that have to be placed somewhere. The simplest solution was to use a part of the LSL footpeg from Suzuki GSXR1000 2009, where the peg, the brake lever and the mount of the master cylinder are installed. 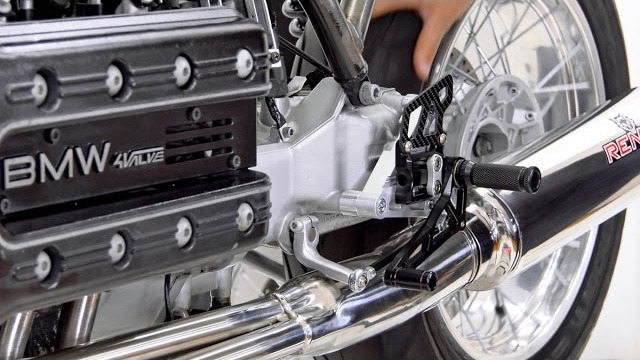 Master cylinder are suitable from many motorcycles, because the mount is standard, but we used a Spiegler one with an integrated brake box, which immediately solved the problem with its placement. This solution is suitable for different projects and minimizes the workload of modeling and milling parts.